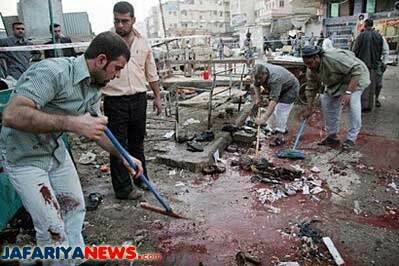 A massive bomb in the Shiite holy city of Karbala killed 52 persons and wounded 75 on Monday according to AFP. Shiites’ feelings are raw over the attack, threatening further civil war violence. Sawt al-Iraq/ AFP report in Arabic that the explosion occurred only 100 meters from the shrine of Imam Husayn, among the holiest in the Shiite world. It scattered body parts widely. 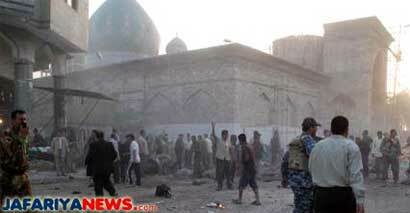 Had the bombing inflicted severe damage on the shrine, the security situation collapsed again. The Shorja market that John McCain visited in spring of 2007 to prove that Iraq is safe was not very safe then, since he had to have a lot of protection. But it is even less safe today, being policed by the Mahdi Army militia, according to CNN. In general, I would discourage McCain or anyone else from deciding on how good a security situation is by seeing whether the markets are bustling. 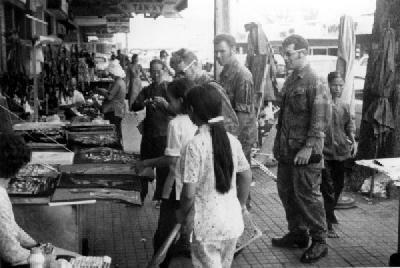 Markets usually bustle, since people have to buy staples, even in the midst of a low intensity war. Indeed, since people stock up, in perilous situations the markets may bustle artificially. McClatchy’s headline says it all: “Cheney cites ‘phenomenal’ Iraqi security progress as bombing kills 40”. Cheney even needed a complicated security routine and lots of bodyguards just to move around the Green Zone where Iraqi and US offices are. The heavily fortified Green Zone actually took incoming mortar fire on Monday, during Cheney’s visit there. If the Vice President of the United States can’t visit the most fortified place in Baghdad, the capital of the country he militarily occupies, without risking a mortar strike, then things are still not all the great. I don’t believe Gen. MacArthur in Tokyo suffered any similar humiliation. ‘ Five years after the outbreak of the war in Iraq, the humanitarian situation in most of the country remains among the most critical in the world. Because of the conflict, millions of Iraqis have insufficient access to clean water, sanitation and health care. The current crisis is exacerbated by the lasting effects of previous armed conflicts and years of economic sanctions. Despite limited improvements in security in some areas, armed violence is still having a disastrous impact. Civilians continue to be killed in the hostilities. The injured often do not receive adequate medical care. Millions of people have been forced to rely on insufficient supplies of poor-quality water as water and sewage systems suffer from a lack of maintenance and a shortage of engineers. Some five hundred Iraqi political personalities with attend a two-day conference for the purpose of working out a national reconciliation plan. Prime Minister al-Maliki wants to reconstitute his cabinet, from which several parties withdrew last summer. The Kurds have already announced that they will not give up any of their security-related seats. – Around 7 am, a roadside bomb targeted a police patrol at Mansour neighborhood at Ameerat street near teachers training institute .One policeman was killed and one was injured. – Around 7 am, a roadside bomb exploded at Seid Al-Haleeb intersection(near Mr.Milk grocery shop) .One civilian was injured in that incident. – Around 9 am, a roadside bomb exploded at Hamah-Zayuna intersection near Shaab stadium in Zayuna neighborhood. Three civilians were killed in that incident. – Around 9 am, Katyusha missile hit the green zone(IZ).No casualties reported. – Around 11 am, one mortar shell lobbed on the green zone(IZ) .No casualties reported. – Around 1 pm, a car bomb exploded at Uqba bin Nafia intersection in Karrada neighborhood. Eight people were injured in that incident. – Around 2 pm, a roadside bomb targeted an American patrol at Al-Fudhailiyah intersection (east Baghdad). No casualties reported, Iraqi police said and we have no MNFI reply to confirm the incident. – Around 2:30 pm, a roadside bomb targeted an American patrol at Rashidiyah neighborhood (north Baghdad) .No casualties reported, Iraqi police said and we have no MNFI reply to confirm the incident. – Around 5 pm, Iraqi army and police found four dead bodies buried in a garden of a deserted house in Wardiyah village of Medaen town (south of Baghdad). – Around 6:30 pm, two mortar shells hit a soccer field at Ghadeer neighborhood of New Baghdad(east Baghdad) near Ibn Saad school .Five people were killed and 7 were injured .Those people were playing soccer when the mortars landed on the field. – Police found (3) dead bodies in Baghdad today. (2) were found in east Baghdad in Risafa bank; 1 in Ubaidi and 1 in Jisr Diyala. While (1) was found in Bayaa in west Baghdad (Karkh bank). . .
– Around 7:30 am, a roadside bomb targeted one of the 77 company’s vehicle ( 77 is a construction company) in Arafa neighborhood in Kirkuk city.One guard (an employee of the company) was injured with a civilian who was in the area. – Police found three dead bodies in Al-Uthayem district (south Kirkuk) today .Police also added that the three dead bodies were for three men who were kidnapped two days ago in Tuz Khurmatu (south Kirkuk). – Sunday night, gunmen opened fire on a supporting committee check point (Sahwa council) at Al-Alam town (25 km north east Tikrit).The Captain of the check point was injured in that incident. – In the morning, gunmen opened fire on a policeman in old Basra (downtown Basra city).He was killed at once.